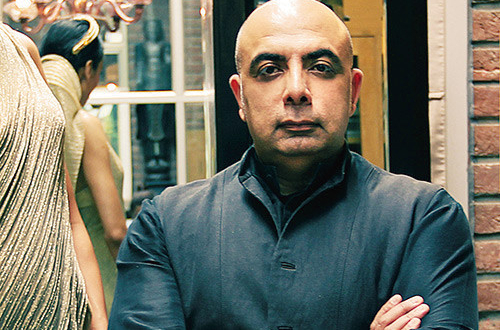 Couturier Tarun Tahiliani has a bug in his brain that will not let him be. It is the creative bug which leads him into new and unchartered territory endlessly. The designer’s Bridal couture is impeccable and it is not enough for him to showcase newer lines on the ramp. His annual Bridal Couture Expositions have become major events on the fashion calendar and open up a world of luxury and high fashion. The first one, in Delhi, involved painstakingly created bridal plaques where everything from the ensembles to the jewellery, furniture and chandeliers were created by him, in a large and luxuriously tented area. Weddings, floral decorations, watches, jewellery, interiors, hotels, he has designed them all. And yet he continues to stretch his artistic horizons, way beyond fashion, seeming to thrive on the very act of creation. His world is over-the-top and yet streamlined and totally on-trend. It is stylish to the core and symbolises the contemporary Indian sensibility. His newest project is designing the public spaces for luxury residences, Cattaro, in Gurgaon. How important is it to go beyond fashion, to designing other lifestyle elements? It’s really one’s choice. I find it interesting as we are a lifestyle brand. It is challenging and invigorating to move between disciplines. From jewellery to watches, bridal flowers to interiors, what is your common design aesthete? My common design aesthetic is an ever evolving ‘India Modern’ look, Indian colours, drapes, jewels and layering. But what does this mean to make things modern – how does one contemporise everything for it to have a relevance to the ‘now’— monochrome, layering, subtle intonations — these always run through. Creating atmosphere the Tarun Tahiliani way – whether it is at the Bridal Expositions or a ramp show, what is the story that you are aiming to tell? That design belongs in an atmosphere, a mood. The people who wear these clothes live a certain life and the shows and expos bring and create that mood to create the atmosphere, the magic and always a bit of romance. While I love the old world, I believe we have to live in this time. So, easy on the nostalgia. Art, architecture, amazing people from all walks of life, textiles, nature and, of course, people who inspire me. What is the difference between luxury and opulence? Luxury is something you know for yourself, finesse and something you feel with all your senses. Opulence is something more for the nouveau world. Though they co-exist beautifully. But opulence connotes ‘showing’ more than feeling and must dazzle to show. Luxury can be very quiet, however, and known often, only to the wearer. What is the USP of a Tarun Tahiliani-styled interior? What will you be designing for Cattaro, the designer residences? Tahiliani interiors have warmth, a lot of natural materials and finishes, textiles, colour and feel like homes and NOT opulent monuments. Homes are to be lived in. We like to live in warmth and of course must have an ‘India Modern’ vibe like everything we do…with a great finish, layering, superb comfort and longevity. These are essentials of what we design. For Cattaro we are doing the major public spaces — the lobby and entertainment areas, and the sky lounge which is a rooftop recreational and entertainment area that will be open to the residents and allow them absolute peace from the city below — a Zen den to enjoy a sunset or read and relax. What according to you has been your greatest design achievement to date? No idea. Still to come I hope. Why include Ancestry, an objects d’art shop, in your store? How does this reflect your design philosophy? We had the space and I’ve always admired their Osler selections. So I set this up because fine couture and crystal are a logical partnership. We have too many new lights in Delhi. Nice to have something old; refined and fine as well. The design philosophy is ‘All that we were and more….’. Sadly Osler is defunct but the legacy lives on – the finest cut glass crystal now available.